Here at Lumber Jack & Jill, we provide tree removal services, alongside the rest of our tree care services. When you have a tree that’s on its last limb (pun intended), it’s time to call upon our tree care experts to cut down your tree with care. Our team brings training, experience, and the right equipment to ensure that your trees are felled with care (tree “felling,” if you didn’t know, simply means cutting a tree down). Our number one priority is safety for our customers, our crew, and the property surrounding your tree. 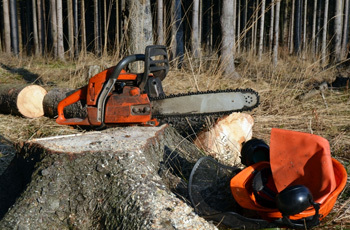 We use state-of-the-art equipment to remove trees from your property. Depending on the situation at hand, we may rely on hand saws, axes, and chainsaws, as well as climbing gear and tree limb tie-off gear to safely lower your tree to the ground. If your tree requires climbing to fell the tree, you can rest assured that our climbers wear all of the safety gear necessary to perform a removal safely. Our team is also licensed and insured to perform tree removals. When it comes to tree felling, training counts. Our team consistently trains to stay up to date with the most current tree care practices to ensure quality services. We understand how trees behave as they are felled. We know where to cut trees to ensure safety for our workers and your property. As a tree care company, we bring over a decade of experience to the table. Alongside practice comes efficiency, skill, and once again, safety. We know the proper techniques to scale trees, cut them, and safely remove them from your property. You can rest assured that our team will remove your tree quickly and safely, even if it is in the most awkward of locations. At the end of the day, safety is our main concern. We take great care to ensure that your property and the residents of your home are protected. We also take great care to make sure that our team is completely safe for the duration of a tree removal. We’ll take every precaution necessary to minimize the risks associated with tree felling. Tree removal is only one of our many tree care services! We also provide tree stump removal services, so that you can have your tree completely removed from your landscape. Lumber Jack & Jill provides the perfect combination of tools, training, and experience necessary to safely fell trees. Learn why we’re the best tree care outfit here in Northern Colorado. Get in touch with us today to get started, or if you have any questions about our tree care services!